Riley came close in his hometown of San Diego, only to lose in a playoff to John Daly at the 2004 Buick Invitational. 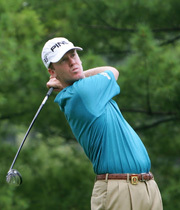 He also won on the Nationwide Tour, the 2007 Rochester Area Charities Showdown at Somerby presented by Think. Tiger Woods says it best when describing Mr. Riley: "He's someone who will fight all the way around, and he never dogs it. He's one of the top grinders out here. And he's such a nice guy--a little strange at times, but that's just Riley." Riley married former LPGA player Michele Louviere in 2002 in New Orleans and they have two daughters, Rose and Taylor Lynn. Riley and family lived full-time in Las Vegas for many years.